Step 1. Brush through your scalp and hair. This will loosen up dead skin, grit, product and oils. Step 2. Make sure the hair is fully saturated with water before applying any shampoo. This will ensure you will get a nice lather. Step 3. 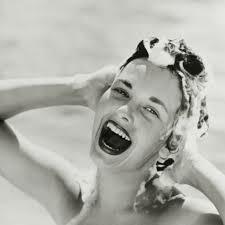 Apply the shampoo (according to how much product is suggested) onto the scalp – not the ends. Scrub into the scalp, working up a nice lather. When putting shampoo on do not do the ends, it dries it out and is not necessary. When you rinse, the suds will cleanse the ends for you. Depending on the thickness of your hair, you may need to wash twice. Step 4. Squeeze out the excess water, this will help the conditioner absorb into the hair. Apply the conditioner to the mid lengths and ends only – not the scalp. Putting on the scalp can give you an oily scalp. Let the conditioner sit for a little bit, you can comb through if you wish. If you’re game you can rinse under cold water and this will seal the hair cuticles. Once out of the shower, towel dry -Don’t rub your hair! It will open the cuticle up again and be harder to comb. Apply your leave in of choice. If you needs a great product come and see us for the right shampoo, conditioner and leave in from the NAK range.